Early spring can be deceptive, with the temporary warmth of strong sunshine, yet with cold winds. Stick to your known best times for sowing, and don’t be tempted to sow earlier. For example I have not yet sown any courgettes, sweetcorn, basil or cucumber, while I sowed tomatoes recently on 18th March, now just emerging on a windowsill. 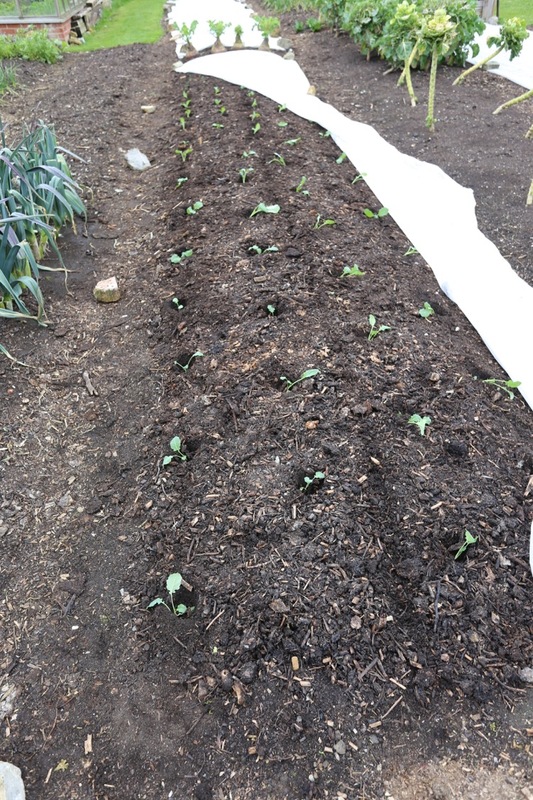 April’s outdoor sowing and planting is vegetables which survive some freezing. A fleece over them keeps cold wind off, and also protects from pests. Sunlight levels are currently the same as in mid September, which is why fleece helps so much, because it converts sunlight to warmth. Some light is lost but there is a net gain to growth. 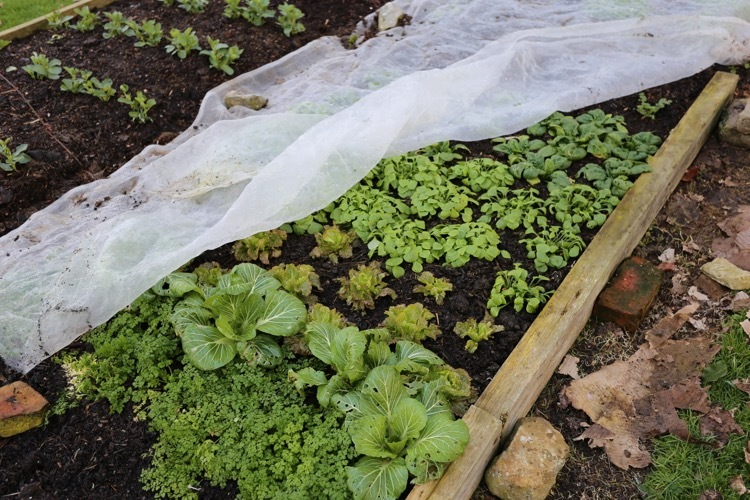 My preferred thickness of fleece is 25gsm but it’s now hard to find and the heavier 30 or 35gsm tends to overheat in any April heatwave, unless you keep seedlings moist. Incidentally you can water through fleece. Homeacres is in a frost hollow and we had two recent mornings of -2C/28F which slows new growth. I am noticing the hedges here have fewer leaves open then hedges on nearby hills where there is less frost. 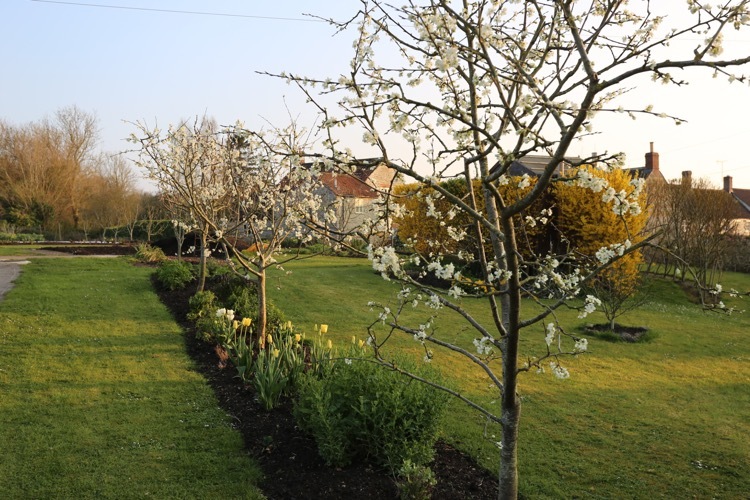 Frost may damage plum and pear blossom, about to open, encouraged by afternoon temperatures of 10-13C/50sF. No dig includes practices which contradict ‘official’ teaching, and this does cause confusion – I suggest reading my FAQs where your questions may be answered. Unfortunately I can’t get the amount of mulch and compost I’d need to go ‘no dig’ in my garden, and the weeds would have a field day. In fact the opposite is true because if soil is dug or tilled, some of its carbon (from organic matter) oxidises to CO2. Digging also stimulates bacterial breakdown of organic matter, giving growth for a while as soil uses its reserves. Plus soil disturbance encourages weed germination and growth: weeds are not vegetables, they grow more in poor and damaged soils. I recommend starting with a lot of compost not because no dig needs it, but because vegetables grow better for it, and weeds grow less. So the compost means big savings of time, high yields mean a smaller area needed for similar harvests, and after year one you need less compost every year, for wonderful growth. I went to my new allotment last Sunday, got there, didn’t know where to start and just stared at it! Helen subsequently came to a talk I gave and said she felt confident now about starting with mulch over weeds. 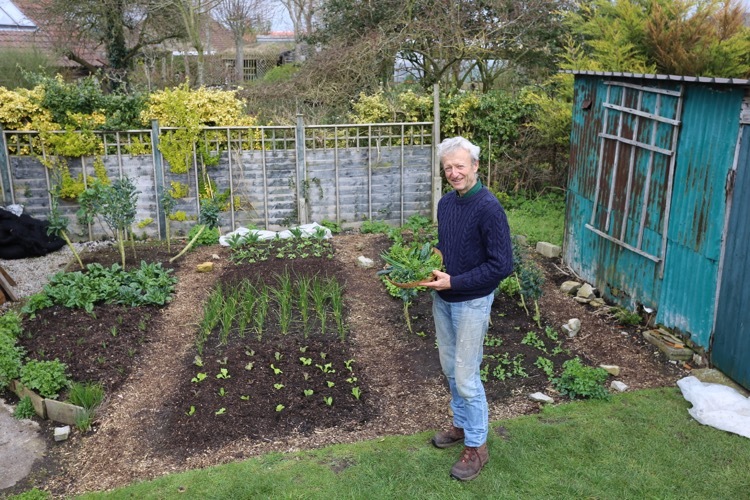 I have sowed carrots already, in view of the mild weather, but there is no rush – last year they grew well from sowing early April, cropping in June. The drills are 1-2cm/half inch deep, made with the corner of a rake or a long dibber. 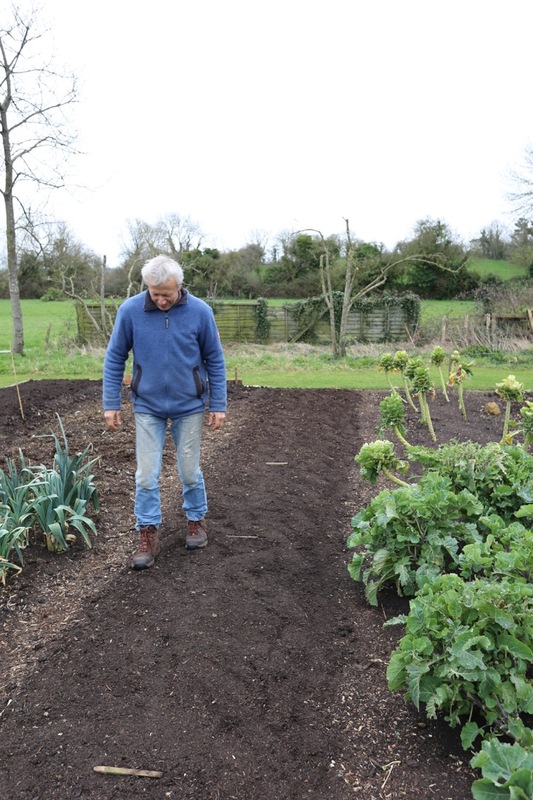 After sowing and with the compost already dry on its surface, and no rain in the weather forecast, I walked on the bed to firm it and retain moisture. This firms the surface but does not compact the soil below, which has a firm yet open structure, maintained by soil organisms such as earthworms. Now the bed is fleeced over and I hope to see carrot leaves about two weeks from sowing. We sowed a few radish too, to mark the lines and for an extra harvest, one radish seed per 5cm/2in. I often say how no dig means fewer weeds, however an exception is if your surface compost has many weed seeds. At Homeacres I experience this when spreading old cow manure where weeds had been allowed to speed on the heap by the farmer (fathen mostly), and when I am careless! 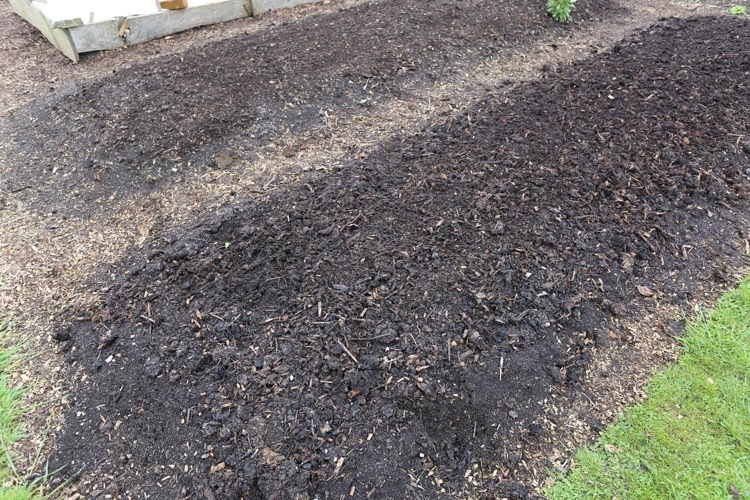 Four weeks ago I spread some mushroom compost and scraped a little of the surface soil when loading my barrow: this soil had been growing many weeds going to seed. 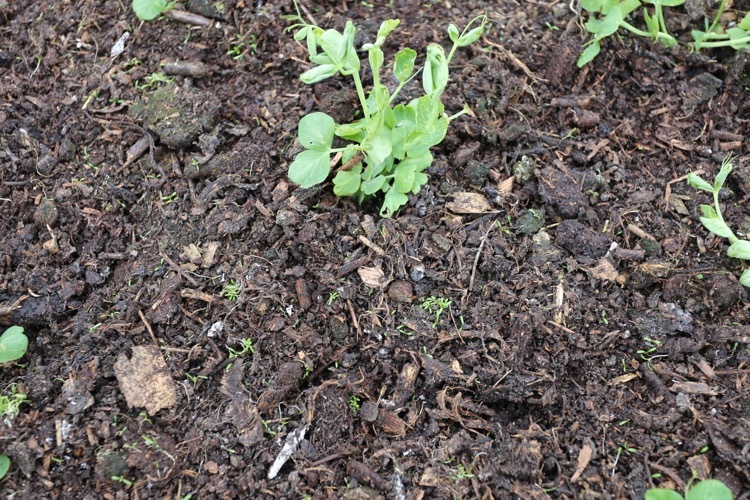 Result, many weeds germinating among newly planted peas. There were thousands, too many to weed by hand and if this happens you must react quickly, to hoe or rake when they are still at two leaf stage, before the roots become strong. I found raking best, swinging gently through the surface to break up the compost lumps and expose weed roots to the dry air. Hoeing in this case was less effective, leaving lumps more intact. You need a dry day for this to work. 1 Speed of growth is usually faster undercover at this time of year – although if the weather is warmer than usual, the difference is less. 2 Pests such as slugs do more damage to tiny seedlings, compared to slightly larger plants, so you may lose more plants – two bites and they are gone! 3 It’s a great practice in that small plants adapt more quickly after planting than large ones: I am often planting at an earlier stage than is recommended generally, especially in summer. See the onion photos in the next paragraph below. I suggest being flexible, because other factors include when you have time to plant, and the weather. Here is another example of small plants. 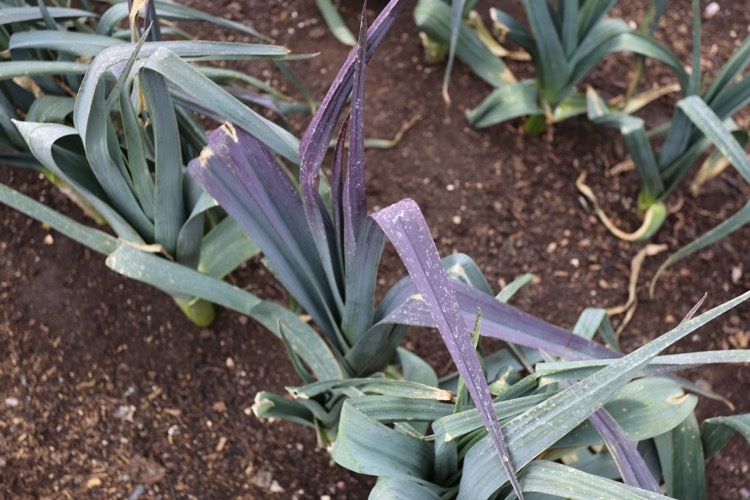 This was not planned but happened after I did a trial of mixing some homemade compost into the potting compost, and onion growth was very poor! Showing how much undecomposed wood is in my compost, which is great as a surface mulch, not for potting. So we sowed again, and tried some blocks too, using a wet mix of three quarters multipurpose compost, one quarter soil. The compost is 50% recycled peat, and peat does help for making blocks. I am trying a few things and like the potential of blocks for saving module plastic, however they take longer to make – see Ladbrookes site, their blockers are good. 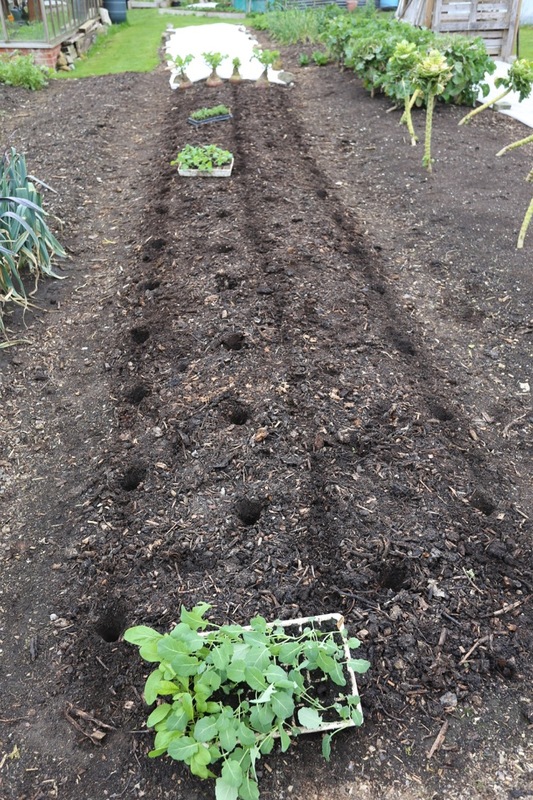 Seed trays are best option for putting blocks into. 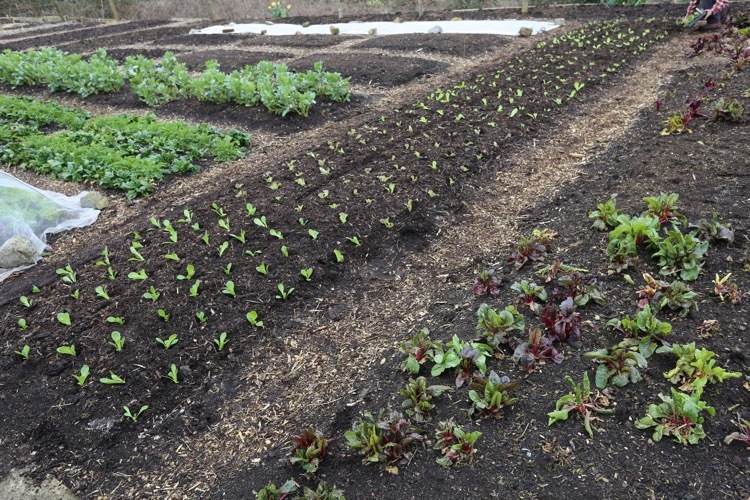 How fine should compost be when sowing and planting? The photos give some ideas. One thing I never do is to sieve compost: some lumps and pieces of wood on the surface are a good mulch. Most problems I hear about are from using undecomposed manures with lumps of bedding such as straw. If you have a surface like that, rake through to break up the lumps, which need air to decompose more. Watch out for slugs in the moist lumps, such conditions are not good for sowing carrots or salads, but you could plant potatoes. Currently Which? 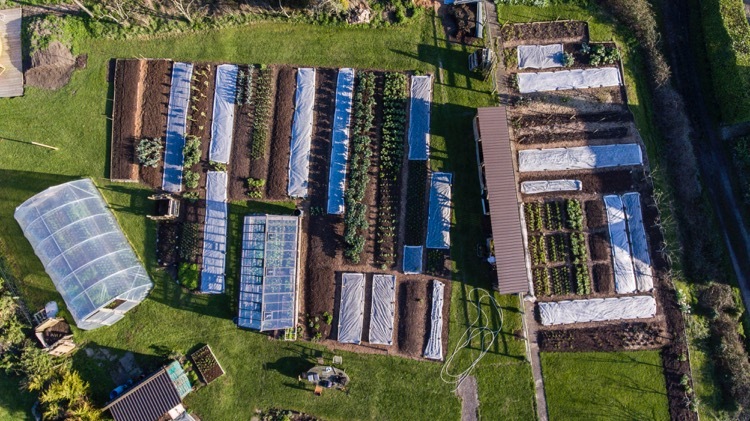 Gardening are running articles about no dig, photographed last year by Jonathan Buckley – Instagram @jonathanbuckleyphotography. 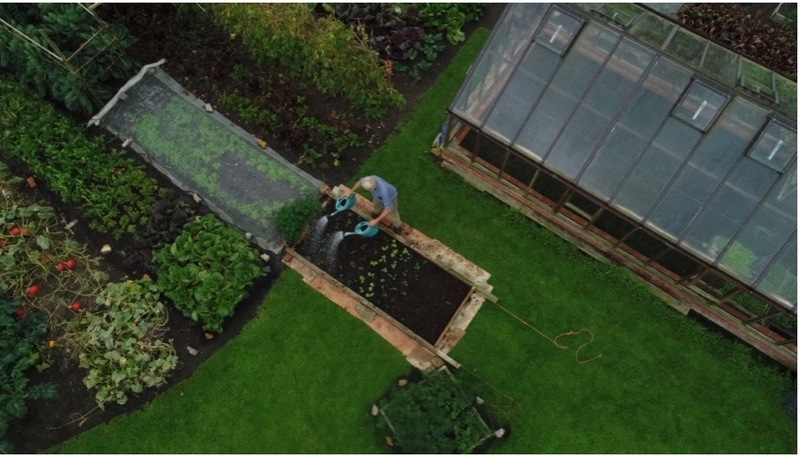 This year we have Jason Ingram (jasoningram) photographing the small/family garden every month, to show what you could grow in 25sqm/270sqft, no dig with successional planting. See the spring video here. I also enjoyed working with Huw Richards to make many new videos, both for his and my channel on You Tube. A first one this coming weekend is the small garden in spring. 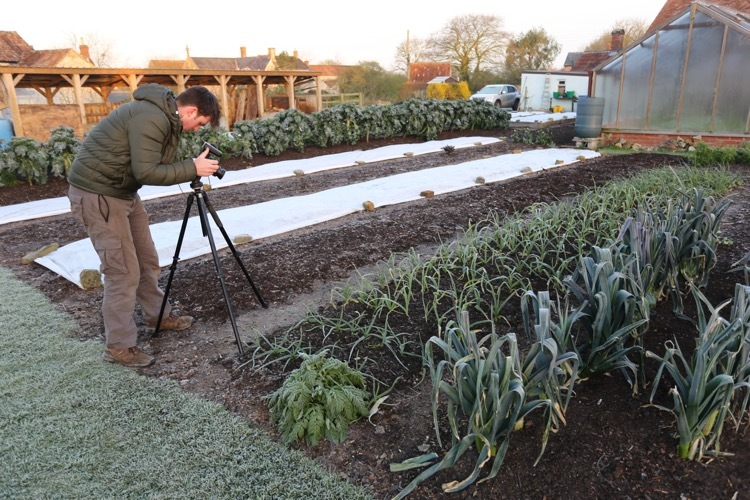 We started at dawn in the frost, it was cold but the results will be great. Huw took the aerial view as well. See this article in Weleda magazine, in German, and spot the photograph error! I solved the deer problem in my garden last year! I strung 3 strands of 30 lb clear fishing line around the garden, like you would barbed wire but the top one 5 feet high. The deer touch it but can’t see it and are spooked. They don’t jump over because they aren’t sure where the top is. Make sure it’s 30 lb line, because they break 20 lb and they SEE 40 lb line. Don’t hang anything on the line. You need for the deer to not know how high it goes. This is our first year growing vegetables and we’re following your no dig advice. At the moment we’ve built 3 raised beds (cardboard on the bottom with compost) and have some polythene down for mulching an area we plan to put a polytunnel on. Thanks for all the advice you give! Fleece admits most light and the idea is that it converts it to infrared warmth. In March your plants are short of warmth not light so best leave it on Dave, and thanks for your comment. Dear Charles! I from Vancouver, Canada and I found you on Youtube channel and following you since then for over a year. I think our weather conditions quite similar and it’s easy to match with your time of starting and growing vegetables. But for a while I want to ask you special question about composting. I saw in your videos you are using horse manure, but horses getting treatment with untibiotis if they get sick and untibiotics are not disolving. Why you are ok to use horse manure for your organic gardening? I want to hear your opinion about it. Having had horses for 40 years I have only ever had to use antibiotics a couple of times. Most horse owners do use chemical wormers though, I try to keep the muck when they have been wormed separate from the general manure. Hi Sarah and this is helpful to know. Just like to say thank you for helping me find complete enjoyment in my garden. I have gardened for years and I like having time to plant,weed and plan. No dig is great and I’m very happy. I find raking really helps brake up compost, and finding weeds (not that there is many weeds.) My compost is not the best this year but the raking is real helping. I have cabbage, kale, spinach beet still going from last year. 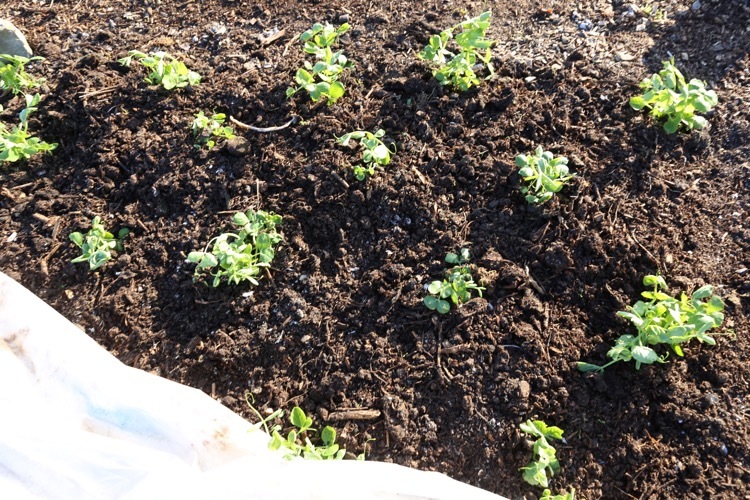 Broad bean, reddish, leatice planted out off warm bed. Carrots on warm bed+ under closh and parsnips up closh. 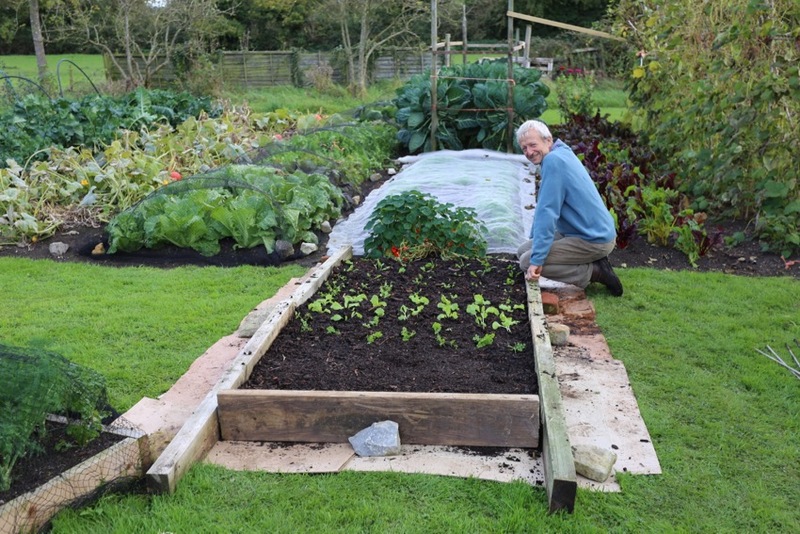 I want to use feece but I worry about voles going under and eat my veg? We are remote and I have had trouble when I started the patch three years ago. I don’t give them anywhere to live. Has this happened to you? 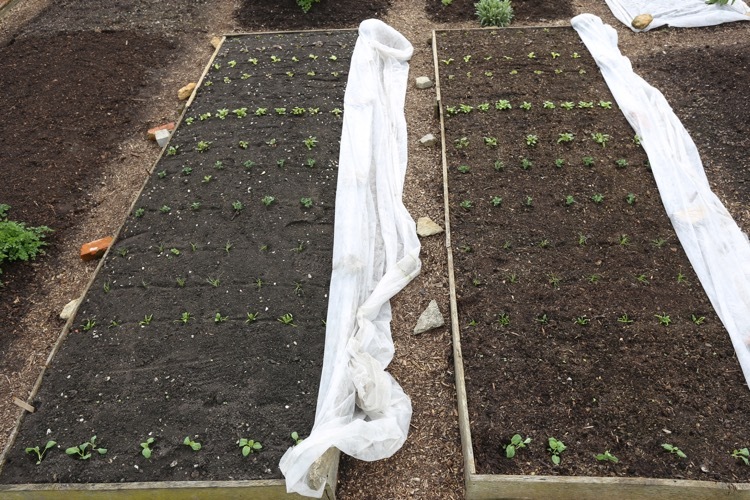 I have pea and beans ready to plan out and radish, beetroot, leatice, spring onions on hot bed in poly tunnel. I think I’m zone 7/8 in south west Scotland? Cheers Billy all sounds good. I suffered voles once, horrible pest for veg but I did not notice them worse under fleece. I caught two with a mousetrap & peanut butter, hidden under large dock leaves as they are afraid of raptor birds. Thanks Stephen and yes paper works, just more overlaps. If 4-6in compost on top, and the paper has got damp, roots will make it through. Lovely to hear this Natalie, well done to you. Scoffold netting won’t keep whitefly off but extra watering is your best deterrent. Dry soil conditions stress plants. Whitefly and all aphids like stressed plants. You will never have none but compost and watering really reduces their numbers, in my experience. We visited Wisley today and were impressed with the allotment plots that the diploma students are cultivating. The plots are half dig, half no dig and it was interesting to talk to a couple of the students who were there working on their plots. The general consensus was that no dig is definitely the way to go! But it was odd to hear statements like “the nutrients in the compost leach out” and “you must not walk on the beds” being trotted out as absolute truths. After a bit I’m sorry to say that I stopped myself from repeating, ‘But Charles Dowding says…’ the whole time. It’s amazing how slowly old habits and beliefs change. Hi Augusta and that is good news mainly! However as you say, there is a huge scaffold of old beliefs that underpins the old methods… more work to do! Thanks for doing some educating. Just adding to the general appreciation. ..2 years on from first you tube eurica discovery. .brilliant stuff of course Charles. .one of the many illuminating realisations is how much more relaxed my 1 acre gardening is now. None of the regular back breaking campaigns against rampant weeds. 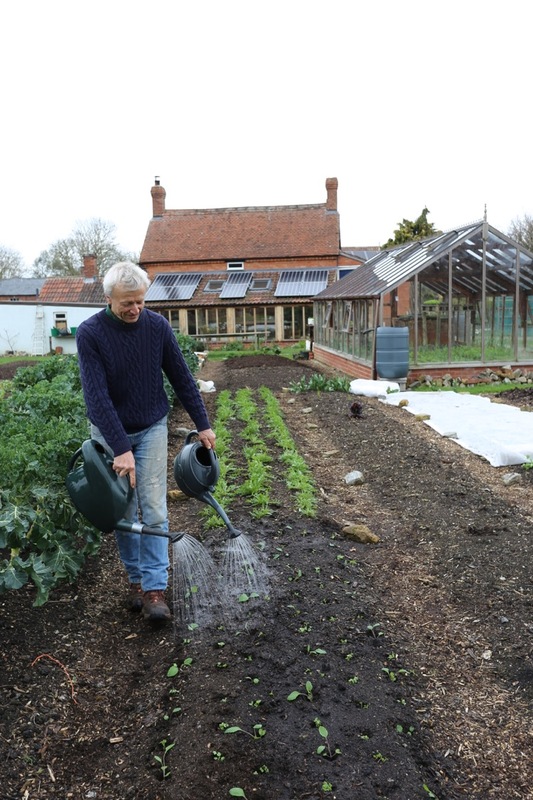 .time to gently hoe and meditate next to the compost heaps etc. Hope everyone has at least bought Charles excellent diary. ..it is not only a great source of advice. .the record building of planting over successive seasons is invaluable. .and I can vouch for the robust format. ..thanks again. .
Lovely to hear this Alex! Thanks for the Diary mention too. Charles, would love to know how much you water things that are in the ground already (both inside and outside) this time of year? We’re in Cornwall, and it is cool but we have had some dry spells and sunny days i.e. no rain for the last week. So, I have been watering younger things every second/third day whilst there is no rain – is this overkill? 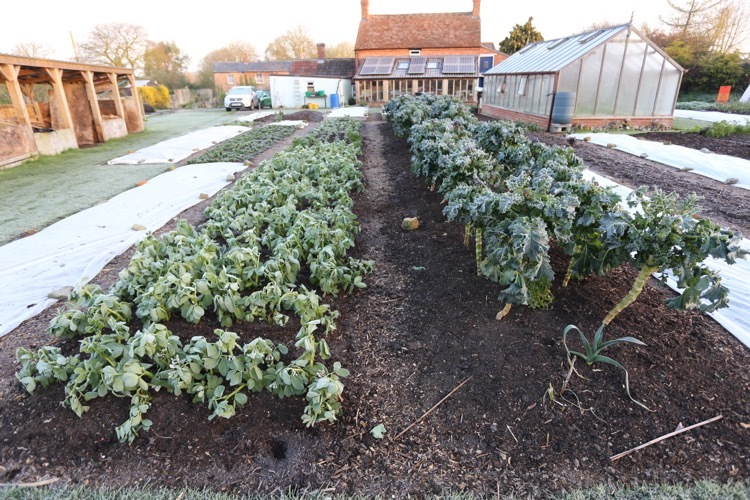 We are doing no-dig, but some of the beds are very new, so they seem to dry out quickly. Hi Jess and yes we have watered new seedlings every 3-4 days just a little, say for 7-10 days until established. Some composts dry more than others so it’s good to check. I’m totally fascinated by no dig and still all the information I absorb just instills more questions! I have this odd situation where I have acquired six 78ft polytunnels, none of which have seen growth in at least two years and the soil is dry and pale, they are odd humid environments and gone to weed. Due to a lack of instant supply of masses of homemade compost I’m literally buying it in by the tonne from council waste and it gets so dry in the tunnels, but better with cardboard on top and constant watering. My question is, being spring, I want to grow what I can and asap, so I’m smothering the ground with this stuff and any broken down manure I find, but is it too late? Better for next year at least. There has been no mulching -is there some miraculous speeding up process?! Any advice would be amazing! Thanks so much. Hello Sas and wow that is a lot of space. That soil was dry and partly dead, now reviving but you may be underestimating how much water it needs. I would dig (!) a hole to check, you may find it’s still dry at depth, just loads of water needed to help life return. Ah lovely to hear this Suzanne and thanks to Beechgrove too, best of harvests to you. Thank you .I must say I thoroughly enjoyed your book and will recommend it to anyone who fancies going no -dig. I feel quite confident about it all now. Hello Charles. What a wonderfully truly helpfull site! Following You since okt last year. Many thanks from north Sweden, where snow is melting in a couple of weeks. Hello and thanks, yes I would use that asap, as it’s your only main option, but add 5cm compost to the top if you can, for seeds and plants to get started. Hope spring is soon for you. Following M Thun, planting starts again this weekend and Sunday is “extra fortunately” for leafy plants. Perfekt timing! Thank you so much for taking time to answer! We’ve just found your videos on youtube over the last 2 months. We’re gardening on an acre in Colorado. We’ve got 8 4x10ft beds that we’ll be planting, and we’re going to start using your no-dig method on our beds. I’ll still be struggling with bindweed(!!!) but there’s no killing that stuff. Waiting for a load of wood chips to be dropped at the house and then we’ll get started with your no dig method. We’re also going to try building a hugulkultur bed in our yard, since we have several downed trees, and this should be a good use for them. 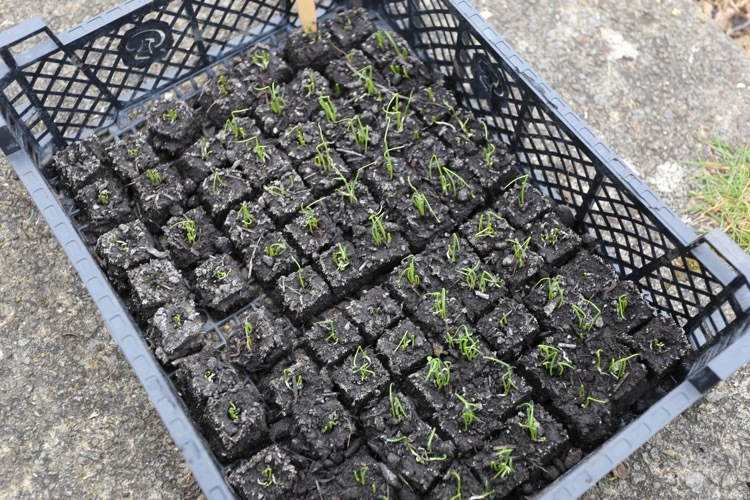 I also wanted to tell you that you can still get the styrofoam seed trays from Park Seed, here in the states. Thanks for the inspiration! Hello Mary and your enthusiasm shine through, happy gardening! Hello Charles! I’ve been following your site and hanging off your every word, picture and video since we bought our first farm 17 months ago. My husband laughs and calls your videos my bedtime stories! I fall asleep thinking deeply about hot beds and seeds of every kind. 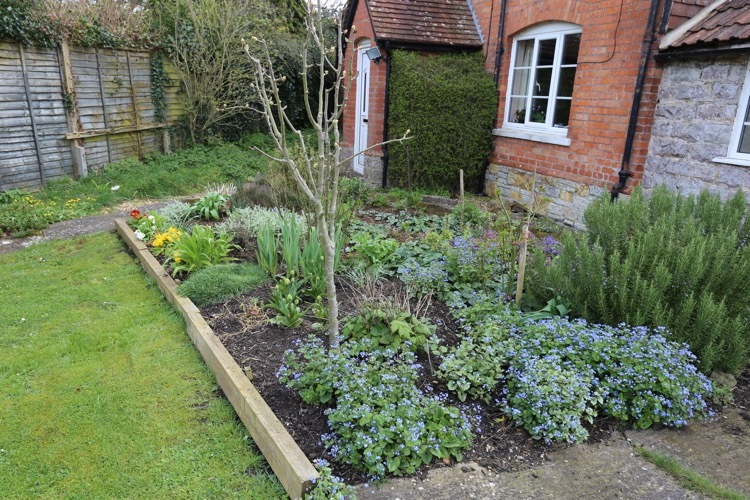 We created our garden beds following your advice in February 2018 and have been eating extremely well since autumn of 2018. The purple broccoli is filling our plates every night as are all the leafy green things. Fall carrots and beets are still coming out of the ground delicious. We have so much to be grateful for – namely YOU!! And of course beautiful land and glorious sun! 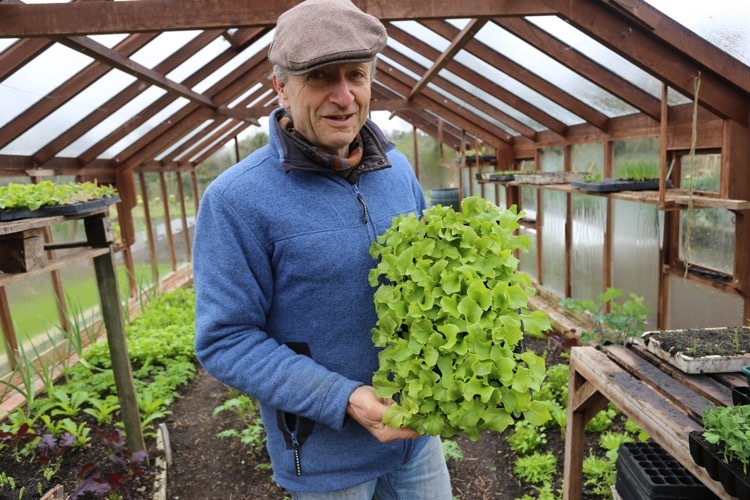 I have done very well with all the seedlings so far this spring – the poly tunnel is absolutely full. We live on the west coast of Canada in a zone 8 location, average last frost date April 1st. Night time lows of 7, 8 degrees celsuis. I do have a question…. I planted my tomato seeds in the window sill on a heat mat under a grow light on March 27th. They have now reached the light tube and need a different situation. Can I pot them on and put them in the poly tunnel now? The peppers and aubergine seedlings are out there and seem to be doing well. I wasn’t sure but had to send them outside for lack of space and light. Thank you SO very much for all that you do! No Dig has been an absolutely fantastic resource and I LOVE my planting calendar – It sets me on track and helps me to record my seeding and planting dates. Ah what a lovely message Noeleen, I am so happy when I hear of people improving their lives like you have. Your location sounds really fine. Yes your tomatoes will be fine in the tunnel, they are more hardy than peppers and aubergines. Just read the Weleda article, very interesting, just wondered what the photo of the chap in the car was doing there ;-)) – I really hope that article will convert some people to no-dig. I’m in Switzerland and at my allotment site I’m the only person far and wide who does no-dig. Often feel like pointing people in your direction, but guess it’s better to let people get on with it and find new methods for themselves. Haha Helle you noticed! The editors apologised, it was their mistake, they thought he was me. It’s embarrassing for me because he is 20 years older!! How odd that the sensible Swiss people are not into no dig. It’s getting common here, I guess it needs a Swiss version of me. My father used to be an incredible organic gardener and used many of your techniques. Unfortunately I was busy raising children when he was actively gardening and he has since passed on. I am hoping your website, books and youtube channel can help me to experience success. One thing I don’t understand, my past experience is that steer manure is full of weeds from what the cows eat. 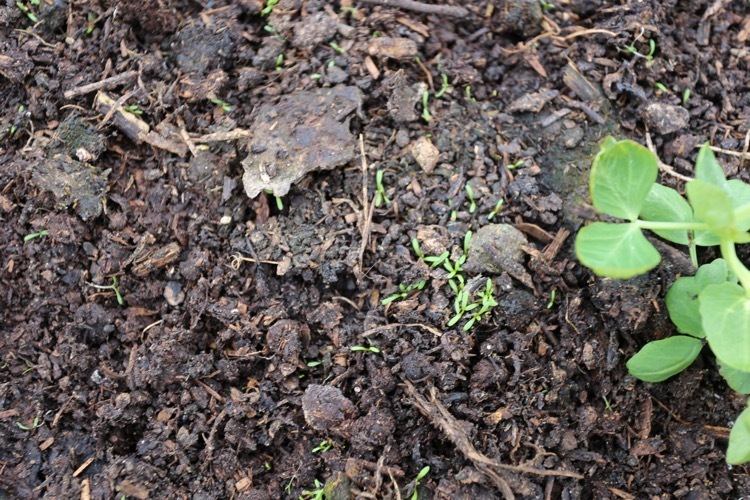 Why don’t those weed/seeds germinate when you use the manure? Is it because when you compost it it gets hot and kills the seeds? Nice to hear Lori and there are no weed seeds in my cow manure because they eat silage rather than hay, when in the barn over winter, and silage is cut before anything seeds. There is some fathen from the farmer allowing them to seed on the heap before he delivered it. I’m having problems with my turnips and radish. Last year they got ravaged by flea beetle. 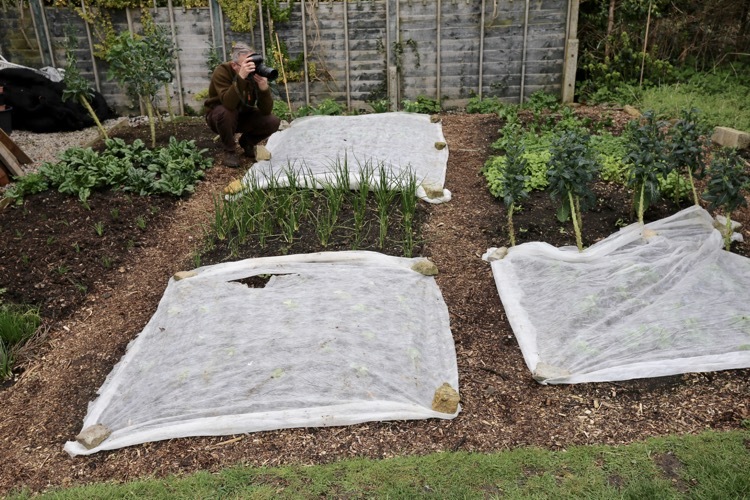 This year I sowed them when it says to on your calendar and covered them with fleece once put outside. I uncovered them yesterday just to take a look and the leaves have loads of holes again and they aren’t really developing – should I give up and just sow later on in the year and hope for the best? I am a 29 y.o sole gardener at Abbot’s Court in Dorset for their restaurants. I have bought a number of your books and consistently watch your new youtube vids so I would like to say a huge thanks for the information. 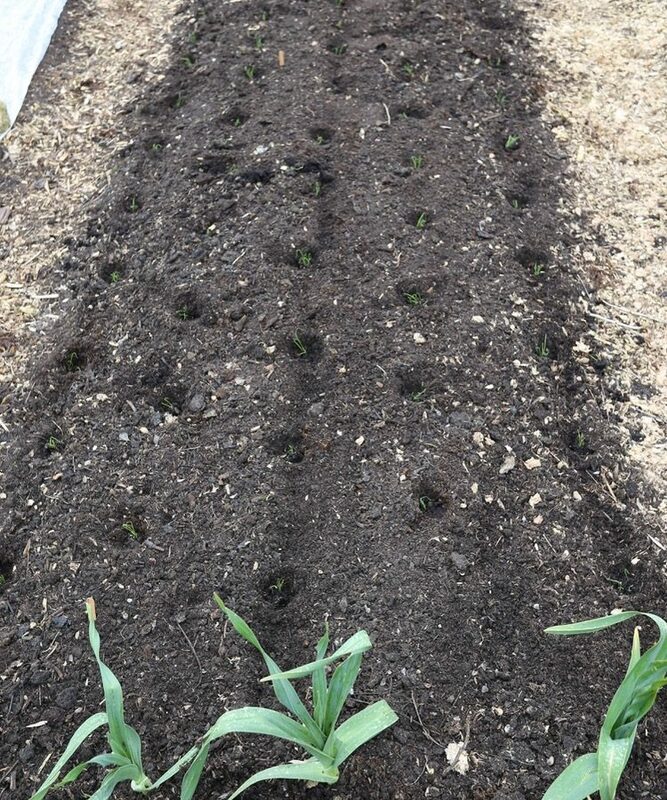 I have implemented no dig on the site and have been using 5/6 y.o horse manure for the beds into one i’ve sown carrots in a 75cm wide bed with 7 drills length-ways. I then covered with fleece and loads of lovely seedlings have appeared, unfortunately thousands of weed seedlings have appeared too! I have tried to use my hori hori knife to go between the carrot drills but they’re so tightly packed in, i’m afraid I will lose just as many carrots as weeds. Also hoping to come to a weekend course this year too! Hi Joe, nice to hear except for the carrots and weeds! 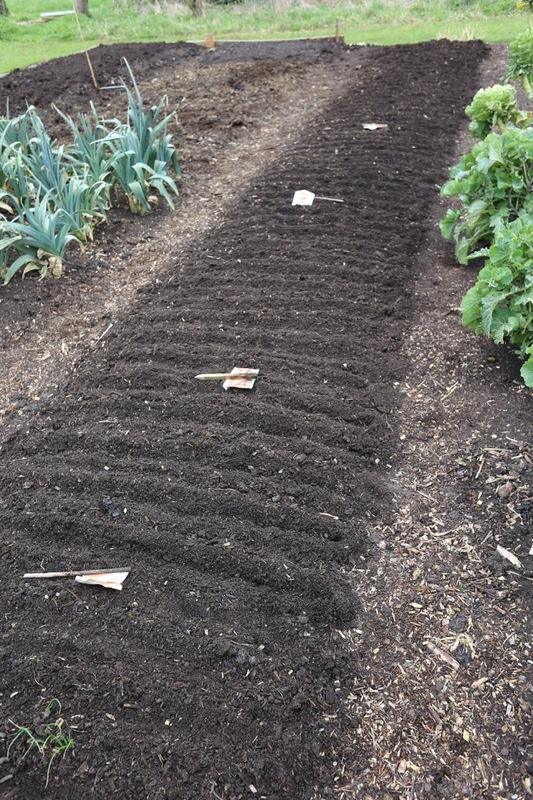 It sounds like either your rows are too close for hoeing between, or you put the manure/compost on v recently before sowing the carrots, meaning you had no chance to do a raking/weed strike of germinating weeds before sowing carrots – that would also have broken lumps and made hoeing easier, in a softer surface. 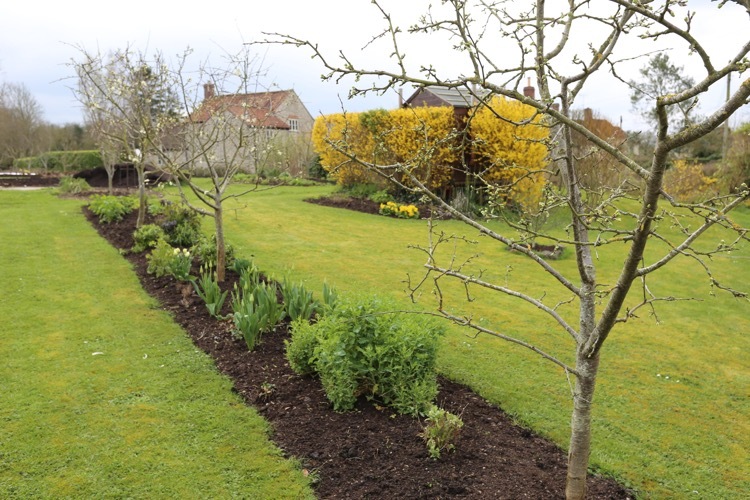 It’s hard to be sure but in this dry weather it may be most feasible to rake across the whole bed and let everything die in the sun, then sow again. 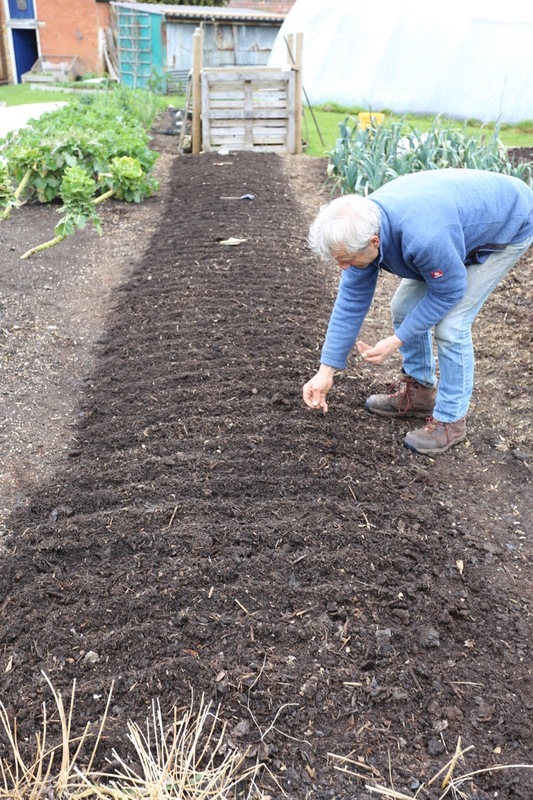 When you resow, draw the drills then water precisely in their bottom, carrot seeds on that moisture and close over the drills with dry material using the rake again, then firm down with the rake.